Did violations ever go away? No, they did not. But what is sad is that despite a conflagration of mammoth proportions that happened just a year back, none, ranging from builder to the authorities, has learnt a single lesson. It is left to the citizens to bear all the risks and also to protest, very much in vain. When in 2017, the fire swept through the seven floors of a popular retailer dealing in silk, a Minister went on record to say that the building had been in gross violation of all permits even since it was built in 2000. The original sanction had been for ground plus four floors, what came up in reality was a structure of seven floors. This was constructed in full public view and yet the authorities remained oblivious of the violations. Thereafter, there ensued the usual process of going to court over the extra floors. Here again, despite orders for demolition of the additional and unapproved levels, the builder obtained a stay and carried on business merrily for a decade and more. That was until the fire came along. There was a wave of self-righteousness in the immediate aftermath. Bureaucrats decried the way buildings had violated norms in T’ Nagar and elsewhere. The Fire Department bemoaned the fact that such structures cut off all access in the event of any major disaster. It was a wonder that no life was lost in the fire, they said. The store owner said he had violated norms and so would bring down the structure (there was not much of it left standing anyway). The public, many of them regular customers of this violator, wrote long posts in social media on how such businessmen thrive. Everyone was agreed that the retailer, if he did construct a new building, would put up a model structure in full compliance of all regulations. They little knew what a builder-bureaucrat nexus can achieve. All of a sudden, a nine-floor structure, inclusive of basement, has come up in the same place. And, what is more, work began on the construction even before the builder filed for approvals, so sure was the retailer that everything would fall into place. The papers were submitted in May and the authorities, with an alacrity that they do not display when more humble citizens apply for permissions, immediately gave the go-ahead. That was in June. And immediately thereafter the builder announced that he had completed 40 per cent of the work – within a month of obtaining approval! Anyone would think that Chennai was a foreign city if this efficiency is anything to go by. The residents of T’ Nagar are up in arms. Firstly, how is it that a structure, which was permitted to have four floors in 2000 can have nine in 2018? In what way has the area become less congested or less at risk for those living nearby? Secondly, given the manner in which the fire raged and consumed many kilolitres of water for being extinguished, how is it that  approvals were so readily given? The Commissioner of the Corporation has himself lamented about the way illegal structures are proliferating in the city and  the Court has come down  heavily on the matter. And yet, no damages or fines  were inflicted on the retailer. Last heard, the matter has been brought to the notice of the Court, which, displaying its legendary patience and restraint, has issued a stay on the construction. But that is least likely to deter the owner or officialdom, both of whom will ensure that the building eventually will come up, as planned, and not as per permits. 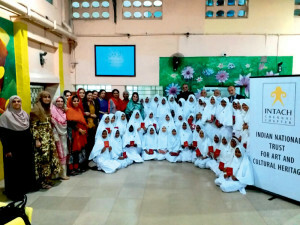 Young INTACH, Chennai Chapter, inaugurated its 36th Heritage Club in schools at the Vocational Training Centre of the Anjuman Himayath-e-Islam School for girls recently. INTACH Chennai’s Sujatha Shankar and Sushila Nataraj walked into a large courtyard full of 300 young girls seated in neat rows. Most of them were there to cheer 40 of their peers who have chosen to form a Heritage Club. This group of 40 stood out, as the girls were dressed in all-white, making a striking picture, they ranged from classes 9  to 12 – all of whom have chosen to be inducted into the Club because of their love and affinity for History. The girls were inducted formally into the VTC Heritage Club with a badge and a ‘Passport’, wherein they would record personal heritage knowledge and experiences. Will Metro offer City decongestion? Chennai Metro is in the news again. More new underground metro rail stations are open. A single train can now take commuters to all major transport hubs in the City. From Central, you can reach the Airport in 50 minutes. About 75 per cent of Phase 1 is now functional. Average daily usership has risen to 45,000 from 27,000. To a cursory observer, these are cheerful developments. Admittedly, these are good but not all, nor enough. A closer study of the present status does not afford room to hope that Metro would complete its promise by 2025. In Phase 1, against the target of July 2014 for two segments of the project, completion was only by June 2015 and September 2016 – late by 11 and 26 months respectively. For five other segments the delay ranged from 17 to 29 months, except one with a 9-month delay, all against the target of December 2015. The remaining segment is already delayed by 30 months and is yet to be commissioned which is the Washermenpet – AG-DMS section. Estimated duration for Phase 2 was 10 years from 2015. This Phase is still in an embryonic stage. Phase 1 is 45 km of which 35 are operational. Phase 2 would cover 108 km when completed. Because 45 out of 153 km is likely to be completed shortly we cannot expect to derive proportionate benefit of 30 per cent. The truncated project will not yield proportionate benefits as commuters who must necessarily pass through Phase 1 corridor to gain access to other areas in the proposed Phase 2 would not use Phase 1 facility till Phase 2 is completed. Sister Isabel Mary Diaz closed her eyes on June 20 in a George Town convent, her home for decades. A Goan, Sr. Isabel earned a name doing stuff, she was great at creating decorations for weddings and church services, making cookies and jams, designing table cloths and clothes for kids. And she did this even at 89. From the convent of the Presentation Sisters, adjoining St. Columban’s School on Mclean Street, her nook was alive from 7 to 8. And she tugged at Peter to pay Paul. For, Sr. Isabel had skilled lots and lots of poor women of this north Chennai neighbourhood to help them make a living. “She was a creative soul who created jobs for the poor,” a nun said in her eulogy. 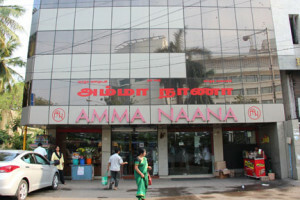 “There is a perception that Amma Naana is an expensive shop. It is not. We sell all the Indian brands at the MRP rates mentioned on the packaging. Imported items are priced depending on the costs incurred in procuring them,” says Senthil Raj, the CEO of Amma Naana, the stand alone department store, well-known for stocking imported brands of a variety of products. The store is located at the intersection of Chamiers and Boat Club Roads facing the Crowne Plaza Hotel (the old Park Sheraton).